Ching-He Huang’s recipe (picture too) from the BBC Good Food website. 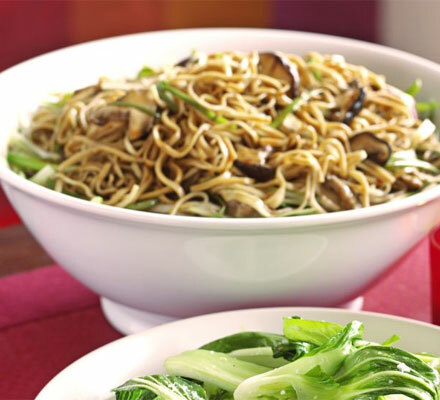 Good with stir-fried pak choi or five-spice chicken. Cook the noodles according to pack instructions, then toss with a little sesame oil (or other oil) to stop them sticking. Heat a wok or large wide pan over a high heat, then add the groundnut oil. Once it’s smoking, add the ginger, stir-fry for a couple of secs, then add the mushrooms with a splash of water to create steam, and cook for 1 minute. Toss through the cooked noodles for 2 minutes until hot, then add the spring onions, oyster and soy sauces and (optional) a dash more sesame oil.